This entry was posted in architecture, enterprise architecture and tagged agility, architecture, defining story, quality attribute, story, storytelling by Kris Meukens. Bookmark the permalink. I think you may have missed part of what Grady Booch was saying – it is also something that Ruth Malan discusses – which is that architecture is about making those decisions which have a significant cost to reverse (or change). Thus it is not that architecture is not-agile (though there is some truth in that), but that it is about understanding which decisions are costly (which I take to mean more than just financial cost, could include time, effort, emotion or politics) to change or reverse once they are made. Thus the agility comes in making just-in-time those decisions that need to be made then, and deferring the ones that don’t need to be made until later, and leaving reversible or low-cost decisions to non-architects. I hope that makes sense. Hi Doug, thanks for your comment. Indeed you mention an additional barrier to change i.e. the cost of “reversing” or “change the change”. It does however not change my view that architecture is the non-agile part in the distribution of the whole. It only enforces that. It adds another barrier. I should add however that “agile architecture” is often being referred too. Does that make sense given the above statements? Yes, I think so. 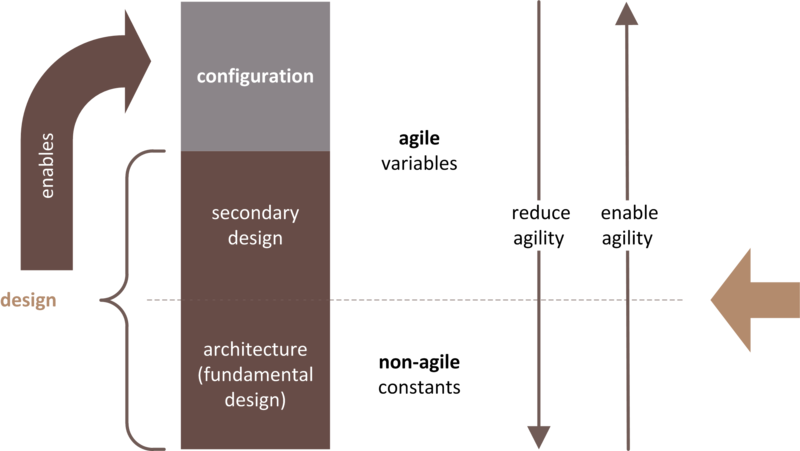 Agile architecture is architecture that pushes desired variability points to the edge with or into the remainder of design (or configuration) hence realizing desired agility. Agile architecture is not architecture that is agile which is an oxymoron, but one that has the distribution right, thus effective. Grady Booch made his statements in the context of software architecture. I am considering these in the context of all architectures, especially enterprise architecture. Hi Doug, this is an interesting comment at a right moment. It made me realize that there is even more ground to cover than I had in mind. Anyhow more to reflect on and blog, hopefully with results soon. Thanks. Thinking about this a little more. Another way to capture what I was trying to get at is to consider the word “agile” as either an adverb (modifying an activity) or as an adjective (modifying a thing). Both are important senses of the same word, but are also importantly different. I feel the quote is not a happy one, as I personally dislike the idea of architecture as a design task. I take architecture as a thing: the actual organization of the system elements and their relations. Now, part of dealing with that organization is actually design, when that task is defined as the decision making based on the manipulation of models that are basically abstractions of a reality. That said, you do design when you work with the real system essence, without all the details. The abstraction level is depicted by the amount of missing details. Architecture design work at high level, meaning with very few details. How few? Enough to be able to understand the whole and still work with its parts. So, architecture is not JUST design, and all design does not happen at architecture level, but ALL design affects the architecture anyway. Above is absolutely not the whole story. There are other dimensions e.g. the actual organization of the system elements and their relations as you bring forward, that are, no doubt, equally important. I’ll come to that in follow-up posts. I agree that all design does not happen at architecture level, and all design “can” affect architecture. The post is not conflict with that in my opinion, on purpose. But for deciding that architecture is not just design, I would need convincing arguments that I have never heard yet. I have come across a school that calls architecture more fluid than design but so far I find especially that argument “fluid”. Different schools often exist because of different semantics. I suspect that is the case here. It might be unknown to you and perhaps some more food for thought as well.